At De Pere Smiles we are changing the way dentistry is done. Gone are the days of painful injections and noisy, nerve-shattering drills. 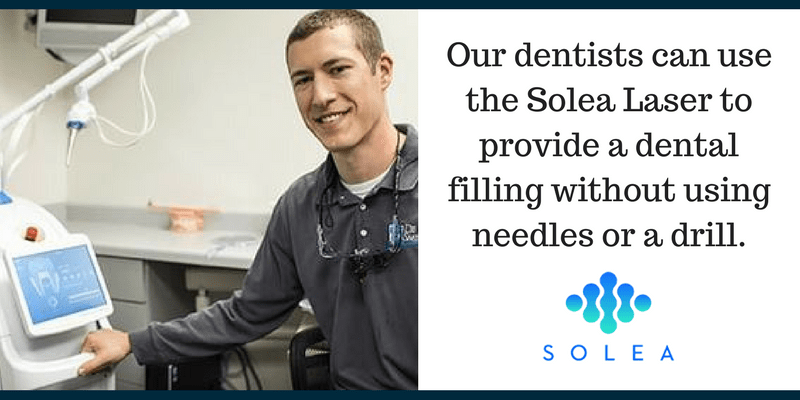 The Solea Laser provides a fast, easy solution for patients who have fear of anesthesia needles and dental drills. Solea is a computer-aided laser system. It is fast, precise, virtually noiseless and provides anesthesia-free, suture-free, and pain-free treatment. Which all means more comfortable treatment for you! At De Pere Smiles, we use lasers for a variety of treatments. For dental fillings, lasers are used to remove the decay in a tooth instead of a drill. It provides superior treatment to the more traditional method, because the laser is so precise it can vaporize only the decay that’s present and leaves the surrounding healthy structure alone. A dental drill cannot do this. Dental fillings with the Solea Laser can be safely performed on both adults and kids, and our younger patients just love it! Many patients worry that a laser will burn or cause them pain. We can honestly say it won’t do either! Some patients do not feel anything at all during their laser treatment. Others may experience a “sensation”, but it is not uncomfortable in any way. Also, laser fillings do not cost any more than traditional fillings! We also use the Solea Laser to perform treatment on the soft tissues of the mouth. For these procedures, the laser seals your blood vessels and nerve endings as it works, meaning there is no need for recovery time and less chance of post-operative infection. We use the Solea Laser to help infants whose frenulum (the fleshy band of tissue that ties the tongue to the floor of the mouth or the upper lip) hasn’t developed properly. Between 4% and 10% of children are born with some degree of frenulum restriction, also known as tongue-tie or lip-tie. Some of these infants have trouble latching on during breastfeeding and it causes many problems for both baby and mom. A laser frenectomy gently releases this tissue, and we have seen very positive results from these procedures. We’ve seen firsthand how helping a family with breastfeeding problems really can change their lives for the better! The Solea Laser can also be used to perform gingivectomies. When someone has overgrown gums, they may have a “gummy smile” – gums that cover too much tooth surface. By concisely removing gum tissue with the laser, it makes the teeth look longer and there is a more pleasing balance between gums and tooth surface – making a more beautiful smile. The “before” and “after” of one of our gingivectomy patients. The “after” photo was taken immediately after surgery – note the absence of blood. There are not many dentists in De Pere, WI or even in all of Northeast Wisconsin who provide laser dentistry for fillings and frenectomies. Our goal is to provide our patients with a full-service practice featuring the best technologies available, and laser dentistry is a focal point of our practice. If you would like to have your next filling without needles, drills, or pain, then call us today for an appointment.